Stories of Nigerian soldiers running away from Boko Haram militants have been widely reported - but low on ammunition and allocated vehicles that don't work, a former soldier says they are being outgunned and overpowered. "Imagine me and you are fighting," the soldier tells me. "We both have guns but while you are wearing a bullet proof vest, I'm carrying an umbrella." It is his way of explaining that the fight against Boko Haram is being undermined because the jihadists are often far better equipped than the soldiers. Abiona is 40 years old and has been in the Nigerian army since he was 17. Or I should say had been, because along with more than 200 others he was dismissed last week for disobeying orders. He was accused of fleeing rather than fighting but says it was a tactical withdrawal. He has survived several battles, in fact he sounds quite fearless, and wants to tell me about serious problems he encountered in the military. "I've committed no crime why should I be scared?" Abiona says. "I don't carry a gun or knife. My only weapon is my mouth." I have heard many reports of Boko Haram attacks where the soldiers ended up running away with the civilians. Traumatized parents separated from their children during the chaos have described to me how they saw troops pulling off their uniforms and fleeing. This is a rare chance to hear from the soldiers themselves. "It was 10:30 at night," says Abiona remembering one battle in Borno State. "Suddenly we saw Boko Haram very close to our trenches. Those of us with machine guns started firing and I can tell you that was a bad day for Boko Haram. We killed more than 80 of them." After the night-long battle his soldiers were low on ammunition but when they urgently called for more supplies each soldier was given just 10 rounds. Not surprisingly, the next encounter was disastrous. "Two days later Boko Haram were back," he tells me. "This time they had about 24 four-wheel drive vehicles, some with anti-aircraft guns mounted on them." Outgunned and with colleagues being shot dead around him, Abiona says they retreated and spent the next 11 hours on the run as the jihadists pursued them through the bush. There were other problems. He tells me about armoured vehicles that were in such poor mechanical condition they would just produce smoke and wouldn't move. During another encounter with the enemy in Adamawa State he says there were military vehicles that ran out of fuel. "What did you do?" I ask. "We had to abandon them and walk. You can't carry them on your head," was his blunt reply. Boko Haram seized the vehicles. Then in the battle for a place called Bazza he says their guns proved no match for the jihadists' firepower and so they again beat a hasty retreat. "They overpowered us and many died. Our mortars and rocket-propelled grenades wouldn't even explode they were so old," says Ibrahim, another dismissed soldier who was in Bazza, adding: "Because of the corruption in the nation it makes everything run down." The soldiers say they have learned that better equipment has recently been supplied to the troops but overall it seems the security situation is getting worse. Just over 18 months ago, I watched President Goodluck Jonathan address the nation on TV as he declared a state of emergency in the north east of Nigeria and promised a massive military operation against the jihadists. 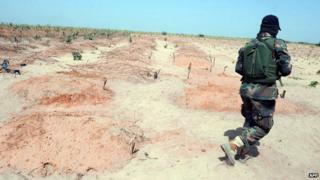 Within a few weeks I was bouncing along sandy tracks with the Nigerian military who were keen to show me some success. We reached the just-liberated village of Marte, close to Lake Chad - along with a couple of other remote settlements it had been briefly held by Boko Haram. I met people who were mightily relieved that the black and white jihadist flags were no longer flying and were hopeful that schools would soon reopen. Back then it looked like Boko Haram would never hold territory again. This week I managed to get through on the phone to one of the people I'd met there. "Where are you?" I asked Abba. "We are all in Maiduguri city. There's not a single person left in Marte now. We all ran away with nothing but the clothes we were wearing," he said. His village is back in the hands of Boko Haram but as a sign of just how disastrous the military campaign has been, huge swathes of north-east Nigeria are now in the hands of the jihadists. Some may call the soldiers I met cowards. Others will say they were poorly equipped and badly let down. "I just thank God I'm alive," Ibrahim tells me, adding: "But I pray for our colleagues who died - we couldn't carry their corpses away. May their souls rest in peace."